Above & Below: Theons #72 is definitely worth $1.99! It has that 'lit from within' glow, multi-colored fine shimmer, and an almost iridescent finish. 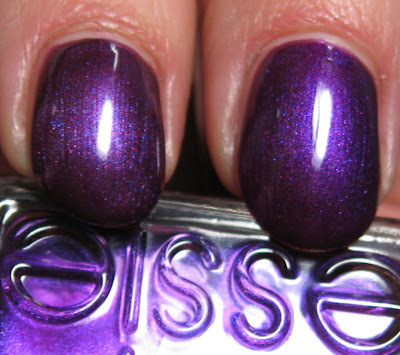 Scroll down for a comparison to Essie's Viva La Vespa. Below: Shown with a coat of Essie's Matte About You. Below: Bottle comparison with Essie's Viva La Vespa. It's a bit lighter and with more red tones than the Essie...at least in the bottle. Below: Theon's is shown on the left, while Essie's is on the left. They're very close in color, but you can see that Essie's has a better quality and looks richer. Below: Theons #11 wasn't as impressive on my nails as it was in the bottle. I should have studied it a bit more, because it does look more foily in the bottle, but I was attracted to the fact that it looked like it may have a black base to it. It really doesn't, although in darker lighting, it does tend to show a darker base. Theons is a little-known brand that's often found at independent beauty supply stores for around $1.99. They don't have a huge color range, although I did spot a green one while doing some Google research about the brand. They're manufactured by a company called Granvill Cosmetics in Miami, Florida, but there isn't a whole lot of information about them online. The quality of these is actually quite good, much better than what I expected based on the price. They both applied perfectly in 2 coats and dried quickly, although I wasn't crazy about the almost foil or metallic finish of the red one, simply named #11. The purple one however, #72, was very impressive. It has tiny multi-colored micro-glitter, a somewhat iridescent reflection, and reminds me very much of Essie's Viva La Vespa. I spotted these over the summer at a local oriental beauty supply, that also carries Ruby Kisses, Wild and Crazy and old Sinful brand polishes. Both are lovely and I see your nails have grown! YAY! i love the purple one. viva la vespa is hard to find now- too bad I'm not living in the us to get all those beauties you post about. Mary I love love love that purple! I wish my beauty supply shops would get these brands stocked!!! Thanks for sharing. The purple looks great on you!!! Both of them are beautiful ! I love the comparison you did with Essie, they really look similar but you're right, the Essie looks richer. I love #72, it's very lovely ! Very pretty polishes on you. I love that purple. The non-fanatics will say that the purple looks just like VivaLaVespa. We can spot the difference. Never heard of this brand, but I love the purple color. For 1.99 it is not bad at all! O wow. I didn't Theons still exsisted. I love the colors! I think I'd be scared if the fire safety warning was the most obvious part of the label! Starrlite~I'm definitely going to be on the lookout for more! Adorepink~the purple one was so pretty. Check some local independent beauty supplies out for them. Ayuu~they make some other pretty ones, I'm sure of it. If they can make one like this, there's bound to be others I love. Tuli~yes, the Essie just had something a little nicer going for it. beautyjudy~thank you! Keep looking, they're out there! amusedPolish~Viva La Vespa is a favorite of mine. I'm not complaining one bit that I live in the US! cbh02b~within 2 weeks, but not sure 'exactly' when! I like Theons polish quite a bit. I do not need fancy names or brands to make me or my nails look expensive. Theons works great in every number. Too bad they lost a place in mainstream polish choices and that is only because I do not want to see this brand disappear altogether. Hey, I just wanted to share, I have a oily nail bed and All nail polishes chip. Except Theon's. I love that! It only wears off, without chipping. I would love to find a local store that carriers the brand. Sally's beauty supplies did carry them and so did a little shop in Stockbridge, Georgia. However, they discounted the price and got rid of the few they carried. I have a tip about #5 or it's #11. It goes on as the color in the bottle. But when you put a clear coat on top. It totally changes the color to a bright Xmas Red. I am an employee of Chelly Cosmetics Mfg., Inc. Theons is a brand that was manufactured for many years under Granvill Cosmetics Mfg., Inc. Granvill Cosmetics used to be a sister company of Chelly Cosmetics Mfg., Inc. The Theons brand is now manufactured by Chelly Cosmetics Mfg., Inc., as Granvill has closed for retirement. The Theons color spectrum has been updated with over 140 shades of nail enamel. The bottle has been slightly modified as well as the printing on the bottle. However, as with Granvill Cosmetics, Chelly Manufacturers the Theons Nail Enamel with top quality ingredients. That is our number one priority! Should you wish to find out any further information, please contact Chelly Cosmetics Mfg., Inc. at 305-471-9608. Thank you for all of your comments!